Jules Verne's immortal tale of undersea adventure, 20,000 Leagues Under The Sea has been adapted to film on several occasions, but it is likely the Walt Disney effort of 1954 that remains, for many viewers and film aficionados, the definitive or "classic" screen version of the novel. Helmed by Richard Fleischer, the veteran director behind Fantastic Voyage (1966), Soylent Green (1973), Amityville 3-D (1983) and Conan The Destroyer (1984), 20,000 Leagues Under The Sea stars James Mason as Captain Nemo, Kirk Douglas as harpooner Ned Land, Paul Lukas as Professor Aronnax and Peter Lorre as Conseil. 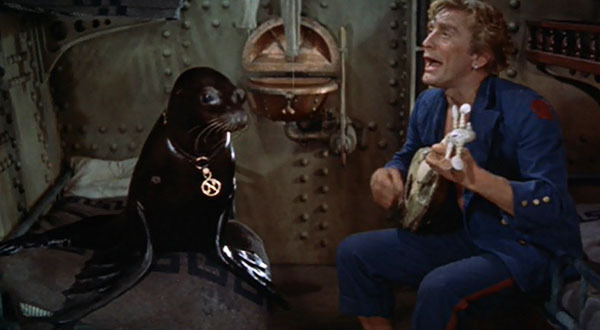 Oh, and did I mention Esmerelda, Captain Nemo's pet seal? 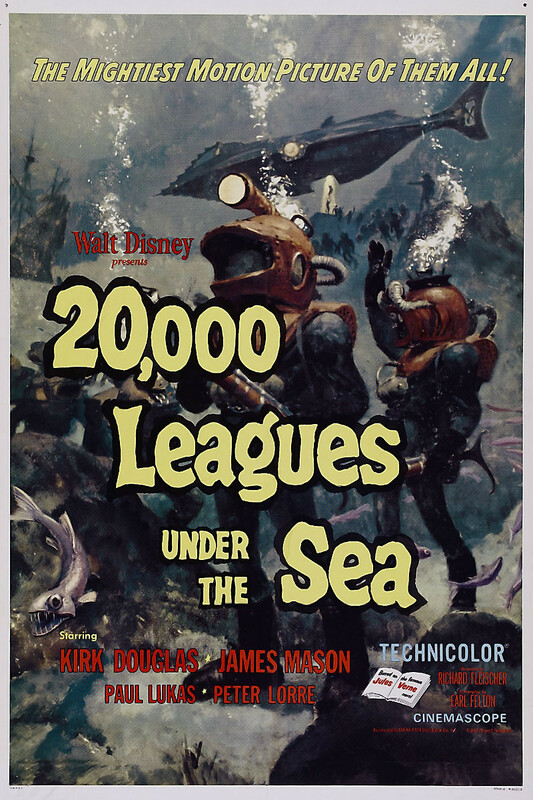 I make note of the seal (a character not present in the Jules Verne story) simply because the cinematic version of 20,000 Leagues Under The Sea takes significant liberties with the cherished source material. That doesn't make it a bad film, but it does make the movie a decidedly...different experience. First and foremost, Fleischer's 20,000 Leagues Under The Sea reflects the Atomic Age of the 1950s and the beginnings of the Cold War epoch. Nemo's magnificent underwater machine, the Nautilis is powered by atomic energy in the movie rather than the electricity of the book. The movie doesn't specifically single out "atomic energy" by name, but Nemo reveals to Aronnax the sub's propulsion unit and and claims that it harnesses "the dynamic power of the universe," which by my reckoning is a euphemism for atomic power. Especially since Nemo profoundly notes that such power could either "revolutionize the world" or "destroy it." Additionally, one of the film's final and most resonant images is that of the archetypal Cold War nightmare scenario: a mushroom cloud blossoming on the horizon. Nemo single-handedly destroys his high-tech island base, Vulcania (another element not exactly taken from Verne's book...) to prevent it from falling into enemy hands. The result is the mushroom cloud; the tell-tale and ominous indicator of nuclear weapons detonation. Indeed, much of Verne's novel has been deliberately re-purposed with an eye towards the contemporary (meaning the 1950s context of the film), and specifically the use and mis-use of atomic power. Nemo reveals to Professor Aronnax, for instance, that his wife and child were tortured and then slaughtered when he refused to share the secret of the atom with his captors in the gulag at Rura Penthe ("the white man's grave yard.") 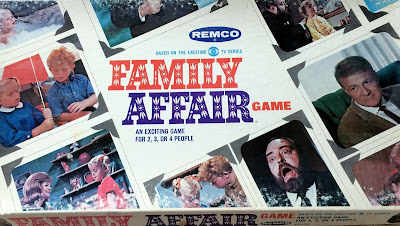 Although the death of Nemo's family is clearly inferred in the Verne novel (near the end), the film provides this much-more explicit exposition about the tragedy. These alterations make the movie's Captain Nemo appear somewhat less misanthropic than his literary counterpart. For instance, in the book, Nemo attempted suicide-by-Nautilus and drove the submarine down into a raging whirlpool, a "maelstrom." He was downcast and sullen over having committed the "murder" of a ship's crew during battle, and desired to end his hopeless, conflicted life. Nemo's last exhortation was a word of surrender: "Enough!" By contrast, Nemo's demise in the Fleischer film is much more heroic in magnitude and intention. In order to keep the Pandora's Box of Atomic Energy firmly closed, Nemo nobly destroys all of his advanced technology on Vulcania and then even scuttles the beloved Nautilus. This final act is not truly suicide anymore, since Nemo has been fatally shot and would have died shortly anyway. Still, Nemo's death in the film brings forth a humanitarian goal: protecting the species from "tampering in God's domain" before it is wise enough to understand that territory. 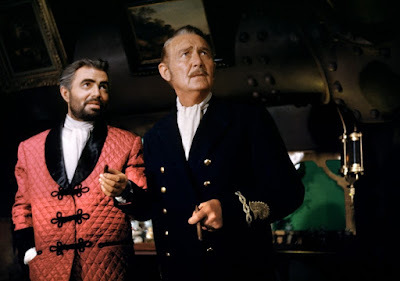 The film version of 20,000 Leagues Under The Sea culminates with a decidedly uplifting voice-over from the late Captain Nemo, one that suggests (as his conveyance, the Nautilus, sinks below choppy waves...) that the character harbored some inherent optimism about the future. "There is hope for the future. And when the world is ready for a new and better life, all this will someday come to pass. In God's good time," he declares beatifically, elevated to the level of saint, if not savior. This distinctly out-of-character statement transforms Verne's dedicated man of science and unrepentant misanthrope into a something quite different: a pollyanna, or a humanist! Again, I'm not stating that the film adaptation is of poor quality, only that it is by no means a faithful adaptation of Verne's original literary vision. In addition to the "comedy" scenes involving Esmerelda -- Nemo's sea pup mascot -- the Fleischer film relies on some unnecessarily broad humor. Kirk Douglas's first appearance as Ned --- with a floozie dangling on each arm -- is a perfect example. In this scene, Ned is comically knocked atop the head by a crutch-wielding charlatan, and then he falls splat in a mud-puddle....after going cross-eyed. Bluntly stated, it's not an auspicious beginning to a remarkable and well-loved film. Again by contrast, in the book, Ned was a forty-year old of considerable experience, intelligence, and seriousness, and not an all-singing, all-dancing, treasure-greedy buffoon...which is precisely how he comes across in the movie. And don't get me started on his obligatory musical number, "A Whale of a Tale." I accept that films made at this time in Hollywood history felt obligated to feature song interludes to net a wide demographic and entertain the whole family, but once more the movie puts up a set-piece of such jocularity that it feels out-of-step with the serious Verne story. I've discussed how Fleischer's adaptation veers away from the trajectory of Verne's novel, but I haven't discussed yet the plethora of ways in which this classic, much-loved film succeeds on its own merits. First and foremost, the visual aspects of Fleischer's 20,000 Leagues Under The Sea remain ambitious...glorious, even. Everything -- from the superb miniature (model) work, to the fantastic set design, to the harrowing action-sequence involving an attack on the Nautilus by a giant squid -- still works. 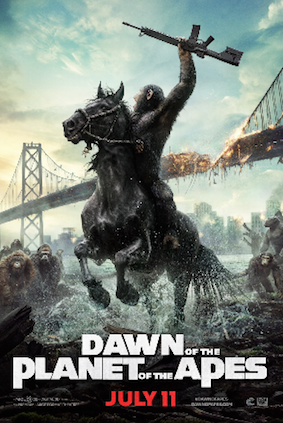 The film's visual effects remain compelling, ingenious, and yes, even fresh. There are some moments at Vulcania and beneath the sea wherein the special effects don't appear to have aged even a day. Which is a pretty amazing feat since this movie was released just about sixty years ago. It's one thing to write convincingly of a hunting expedition at the bottom of the sea; it's quite another to see those images play out before your very eyes, rendered entirely plausible...and wondrous. Furthermore, while one can (and should) make extensive note of the myriad ways the movie changes some conceits in Verne's book, one might also remember that some clever updating of a nearly century-old book was likely necessary. An electricity-powered submarine just wouldn't seem like a very interesting vehicle of fantasy to audiences in the 1950s, would it? The deliberate infusion of Atomic Age moral questions into 20,000 Leagues Under The Sea grants the film a didactic quality, and more importantly, a relevant one. Admirably, the Fleischer film also fully preserves the Arronax/Nemo philosophical debates of the original text. We learn in the film -- just as in the book -- of Nemo's ingenuity and invention when it comes to diet ("the sea supplies all my wants"), harnessing resources (we actually get to see his men farming at the bottom of the sea...), and inventing new technology (the amazing Nautilus itself). We view his commitment to vengeance, and are afforded some dramatic close-ups of an anguished Nemo at the wheel of the Nautilus, on the attack against those who have so egregiously wronged him. The film also preserves Arronax's first-person narrator role in the form of a voice-over, whether recounting the sinking of the Abraham Lincoln (a vessel not named in the film...) or his first experience with the "twilight world" under the sea. In the book, Nemo had a manifesto of sorts: the captain's dedicated declaration of independence from nationalism, civilization, and "unjust" wars. That manifesto too survives the translation to Fleischer's film. Mason delivers a calculated, seething, and most importantly, pragmatic monologue about the ways that Man's "evil drowns on the ocean floor," and that -- only beneath the waves -- does there exist true independence; true freedom. This speech remains one of the film's finest, most transcendent moments. In fairness, the Captain's darker side isn't totally ignored, either. I appreciate that the movie provides a sense of balance; making more than mere passing notations about the classic anti-hero's darker side. "The power of hate...it can fill the heart as surely as love can," the movie notes of Nemo, and that observation is right on the money. Aronnax likewise ultimately calls Nemo a "murderer" and a "hypocrite," while Ned terms him a "monster." These declarations seem very accurate to the spirit of the book, and I can't really complain that the movie seeks to provide Nemo a more explicit redemption than that found in the text; so that 20th century audiences return to the light of day with a sense of moral uplift. It's often quite difficult to judge objectively a movie that you grew up with and which you still love so emotionally. Nostalgia inevitably creeps in and colors perception. 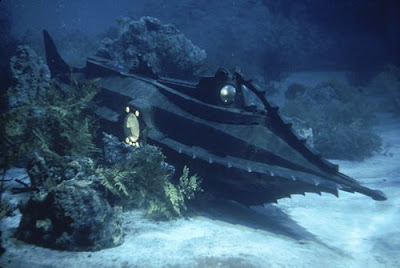 In terms of 20,000 Leagues Under The Sea, I can say with some certainty that the film remains a technological marvel; that Mason's Nemo endures as an inscrutable, larger-than-life icon, and that the film overall is fast-paced, exciting, and scary in good measure. I'm quite aware that books can't be movies; and movies can't be books: that the two media boast as many differences as they do similarities. Yet, here's the crucial difference in intent: Jules Verne's 20,000 Leagues Under The Sea concerned a misanthrope who had given up on man entirely; an anti-hero who had cast off the auspices of "modern" civilization for an exile under the sea, taking only man's best "art" with him (music, paintings, books). Nemo was finished with the world above the waves and no longer cared what we did with our domain above the waves. In the movie, 20,000 Leagues Under The Sea, Captain Nemo is a great inventor with a tragic past who simply believes man is not ready for his new science, a man who actually protects and preserves the corrupt human race by destroying his miracle technology before it can do harm. That's a pretty big difference isn't it? Maybe not 20,000 leagues worth; but certainly enough to drive a submarine through. This is on my short list of movies that demand a re-release in Blu Ray. A remaster of this film in HD would be a glorious thing to behold! It's already done & available for viewing. Disney did a horrendous (and I mean BAD) 2nd restoration a few years ago that was meant for Blueray but never released, but you can see it via Amazon Prime Movies and several other sites. The color was messed with hugely (all the underwater scenes were changed to be the same shade of Teal Blue), the fantastic ramming of the ship in the middle of the movie... during a blazing sunset... was changed to a blue sky (!) and the Nautilus underwater sequences at the end changed the sub to a black silhouette. Forget it - get the Special Edition DVD that came out 11 years ago with a restoration by Scott McQueen. Gorgeous, and true to the 1954 original release print. John accurate review of this wonderful film. I can forgive the musical number and the broad humor with Douglas because it is a '54 Walt Disney Film. I think if it was done by M.G.M., like '56 Forbidden Planet, the musical number would never have been included. I have enjoyed every film and television series attempt to adapt Jules Verne's novel. Albeit, Walt Disney's 20,000 Leagues Under The Sea is still the most impressive adaptation yet made. This '54 Nautilus production design has always been my favorite. Director Bryan Singer is currently in pre-production 2017 film remake. A lot was riding on the success of this film. Had it not been a top quality product, the money for Disneyland might not have come through. Walt actually halted production of the squid attack until a well established 2nd Unit Director was able to make it work (the first go, done by Fleischer was a disaster). One thing about Disney, during his life he made sure his product was well made. I agree with Monc that this film needs a blu-ray release. The dvd, which I recently acquired, has a bounty of wonderful special features, including a series of documentaries on the making of the film. The squid attack, as David mentions, is a fascinating piece to watch as it was (painfully) brought to life. The film makers also developed new techniques for filming underwater, without which we may have never enjoyed Voyage to the Bottom of the Sea years later! Great review and Thank You for the contrast between Verne's book and the movie's ideals. I recently stumbled upon your blog. I have a feeling I will be spending many an hour exploring your various entries. 20,000 Leagues was a favorite film of mine since early childhood, made even more so by my 10 years of service in the US Submarine Force later in life. I can remember how excited I was when my family and I went to Disney World in '79 to be able to board the famed Nautilus and take a voyage that may not have exactly been 20,000 leagues, but was exciting none the less.